We sat down yesterday with Steven Snow, Vice President of Productions for Riot Games, to talk about their free upcoming release, League of Legends: Clash of Fates. Gamers who are familiar with the Warcraft 3 mod Defense of the Ancients: Allstars (or DotA: Allstars as it’s also known) are likely to feel right at home with Legends as it uses the same style of play. What’s more, the designer for DotA: Allstars, Steve “Guinsoo” Feak, and the creator of the fansite that was the official support base for it, Steve “Pendragon” Mescon, are both involved with the making of this game and it definitely shows. 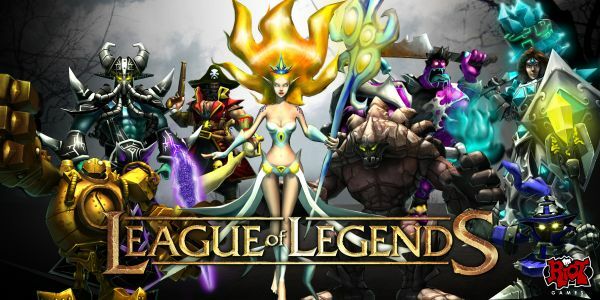 The gameplay for League of Legends focuses on two teams of five players that are trying to take out the other team’s base. This might sound like a standard 5v5 RTS style game, however, the action is more akin to Dawn of War II than Starcraft. A group of minions spawn at regular intervals from your team’s base and march towards the other team’s base attempting to leave a path of destruction in their wake. These minions aren’t strong enough to destroy the other team by themselves, so each player takes control over a champion. These champions are equivalent to a hero-type unit that has more life, attack, and defense than the minions, as well as special abilities to either take out opposing champions or support their fellow champions. The champions, 34 in total for now, generally fall into one of three categories: tank, support, and DPS/nuker. The champions’ abilities vary across these categories and the champion themselves, and each serves a specific role in combat that ensures players will definitely have to work together in order to bring down the other team. [League of Legends] may look like it’s just a one single-minded player kind of game. The reality of it is that League of Legends and the DotA gameplay experience is, at its root layer, team-based. You can have a group of guys, and we did this in an internal competition we had, that are really, really good and know what to do with this champion and know what the best strategies are… that will get wrecked by a team of mediocre guys who know how each other play… The teams that are really, really good are the ones that understand that it’s not necessarily about how many kills you get in the game, it’s about how you move your team’s momentum. As we briefly mentioned at the beginning of this article, Riot Games is providing League of Legends to the gaming community for free. Pay nothing, get everything. Steven confirmed that players would not be charged to unlock certain abilities, champions, or anything else that makes up the game through some series of “microtransactions.” The only elements that Riot Games will ask players to pay for are alternative appearances/outfits for the champions, and for things called “booster packs” that will allow players that may not play as frequently to earn more influence points for a match. One of my first multiplayer game experiences was Doom; but it wasn’t Doom multiplayer, it was null modem co-op. It took about two days for my buddy and me to go through the whole game together, and it was one of the best experiences I ever had. He and I are still friends and we still talk about that [session] probably about two or three times a year. And I realized later that it wasn’t because I owned him or he owned me, it was because we went through the game together and that’s what really makes experiences… Yeah, it’s cool to own up on a couple of dudes because you’re that good, but at the same point in time, being able to get out of the game afterwards and talk about “hey you did this and I did that” is really where things come together.